For 2 decades, the Art Fest ranked in the top one-hundred art shows and is a Naples favorite! 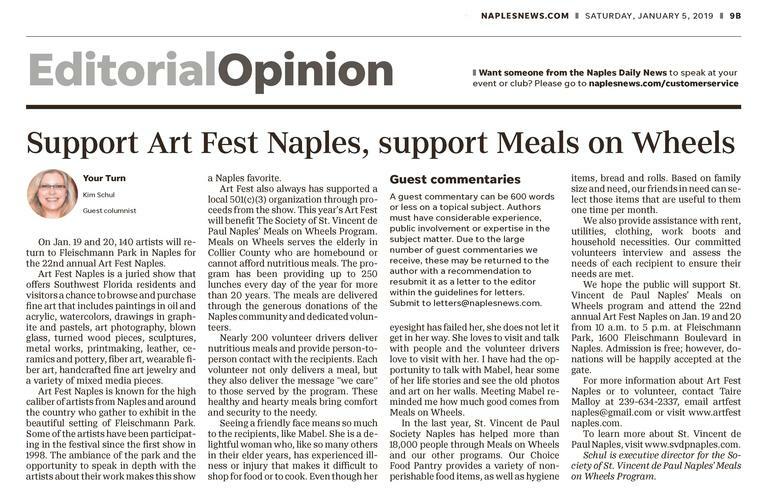 As well as presenting top artists, Art Fest Naples 2019 is unique because it helps benefits St. Vincent de Paul's Meals on Wheels. Many families have received help from organizations affiliated with the show for the past 21 years. 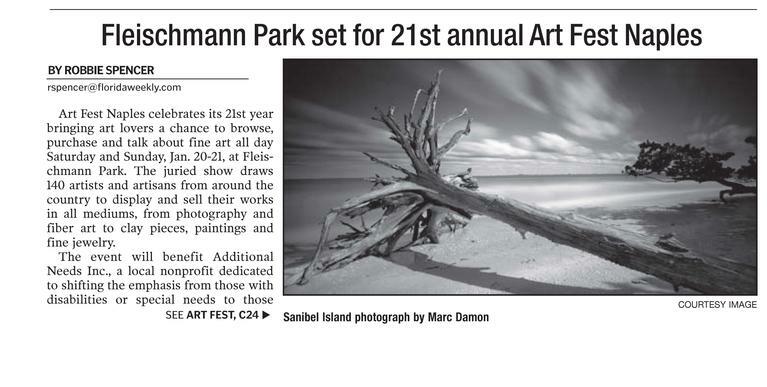 The Art Fest is proud to present talented artists in the beautiful setting of Fleischmann Park in Naples! 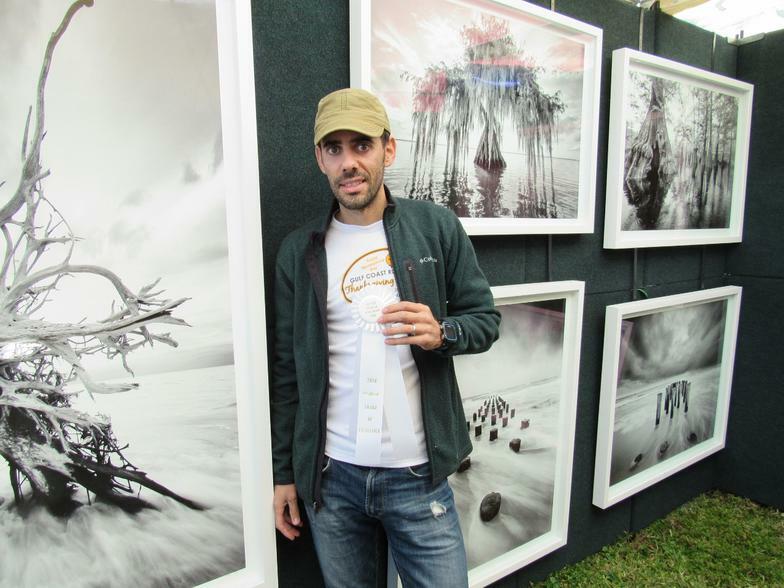 (Naples, Fla. – July 20, 2015) –Art Fest Naples at Fleischmann Park is seeking artists working in all media to exhibit at the annual show. The juried art show will be held January 23-24, 2016 at Fleischmann Park, 1600 Fleischmann Blvd., Naples, 34102. The show was rated in the top 200 shows in the country by Sunshine Artist magazine. A jury of arts professionals will select the artists to participate in the show and will award prizes in numerous categories. All artists must apply online at www.artfestnaples.com by October 15, 2015. In addition to the beautiful park setting, Art Fest Naples is unique in Florida and the country because the proceeds benefit a 501(c) (3) organization, the Special Needs Children’s Fund. The mission of The Special Needs Children’s Fund is to improve the lives of children and young adults with physical and developmental disabilities, including autism, in Collier County. “Some of the nation’s finest artists will be participating in Art Fest Naples, displaying and selling their work ranging from oil, acrylic and water color paintings, blown glass, turned wood pieces, sculptures, jewelry to a variety of mixed media.” said Art Fest Naples Director Taire Malloy. Sponsorships are available. 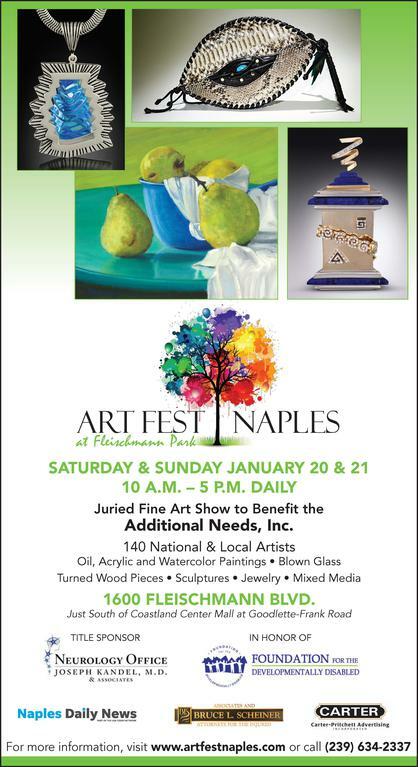 For more information about the 2015 Art Fest Naples contact Taire Malloy at 239-634-2337. Email artfestnaples@gmail.com or visit www.artfestnaples.com. 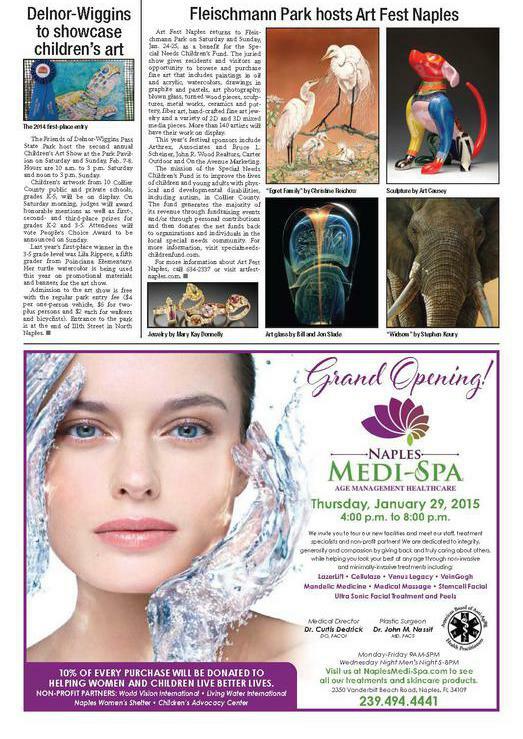 • Paid ad schedule of full color quarter page ads in The Naples Daily News. • In 2015 The Naples Daily News generously signed on as an in-kind sponsor with an ad schedule valuing $5,000. • Paid ad schedule in The Naples Florida Weekly and The Bonita Florida Weekly. Half page, full color ads run in these well-read local weeklies. • Paid advertising schedules on NBC-2 and WINK (CBS). In 2015 both stations provided added value spots to our schedule. • Facebook page with weekly paid “boosts” to our posts reaching more than 7,500 people and more than 300 likes/comments/shares in 2015. • Beasley Broadcasting was at the event in 2015 and donated PSAs. Beasley has six radio stations in Southwest Florida reaching a variety of audiences. 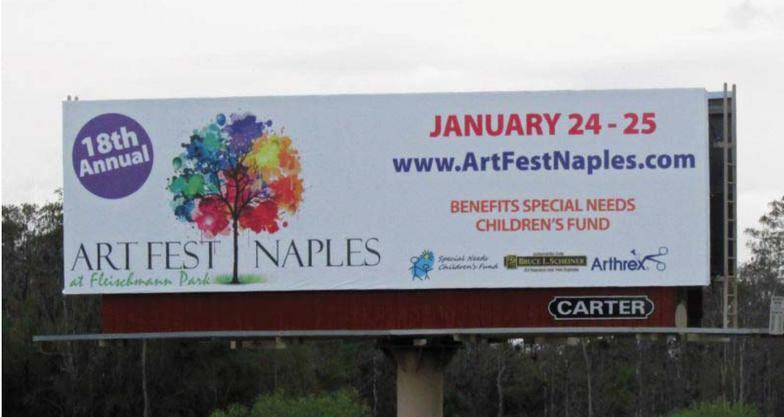 • In 2015 Associates and Bruce L. Scheiner donated a billboard in Lee County to promote Art Fest Naples. 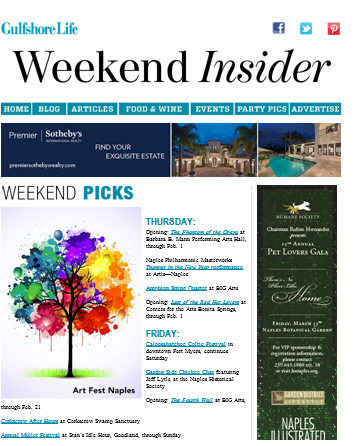 • Art Fest Naples will be on all the local event calendars and we send out press releases about the event to local media. 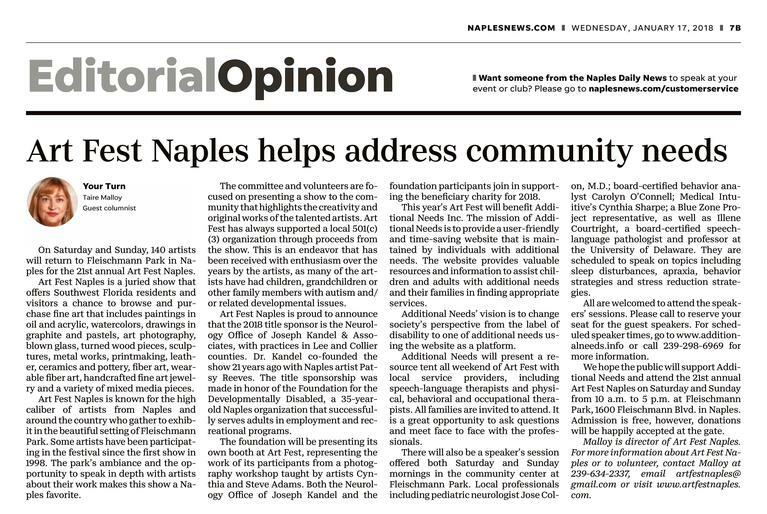 • In 2015 our guest editorial ran in both The Naples News and The News-Press (daily papers in Collier and Lee counties. • Event director Taire Malloy was featured on WINK News This Morning. 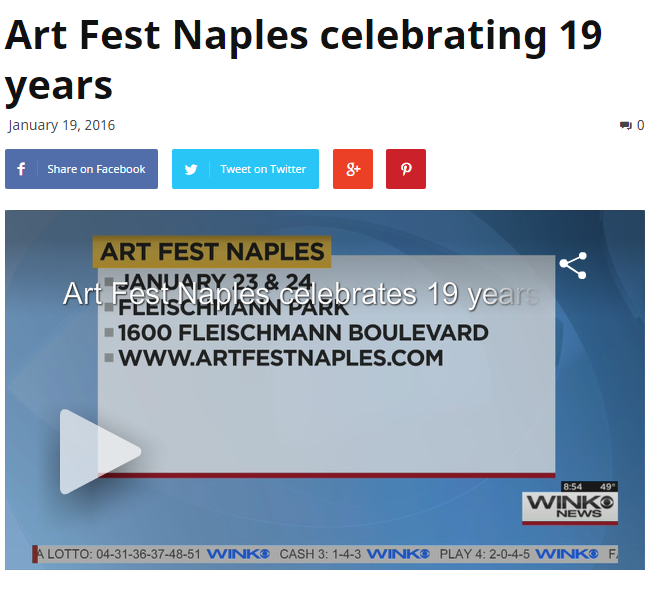 (Naples, Fla. – December 10, 2015) –Art Fest Naples returns to Fleischmann Park on January 23 and 24, 2016. Art Fest Naples is a juried show that offers Southwest Florida residents and visitors an opportunity to browse and purchase fine art that includes paintings in oil and acrylic, watercolors, drawings in graphite and pastels, art photography, blown glass, turned wood pieces, sculptures, metal works, ceramics and pottery, fiber art, hand-crafted fine art jewelry and a variety of 2D and 3D mixed media pieces. Sponsors include: Arthrex, Associates and Bruce L. Scheiner, Carter Outdoor, The Naples Daily News, John R. Wood Realtors and Driftwood Garden Center. “Art Fest Naples draws 140 of the best fine art and fine craft artists from around the country and is a must do for residents and visitors of Southwest Florida,” said Taire Malloy, event director. In addition to the high caliber artisans and beautiful Fleischmann Park setting, Art Fest Naples is unique in Florida and the country because the proceeds benefit a 501(c) 3 organization, the Special Needs Children’s Fund. The mission of The Special Needs Children’s Fund is to improve the lives of children and young adults with physical and developmental disabilities, including autism, in Collier County. Fleischmann Park is located at 1600 Fleischmann Boulevard in Naples. Sponsorships are still available. For more information about the 2015 Art Fest Naples contact Taire Malloy at 239-634-2337. Email artfestnaples@gmail.com or visit www.artfestnaples.com. 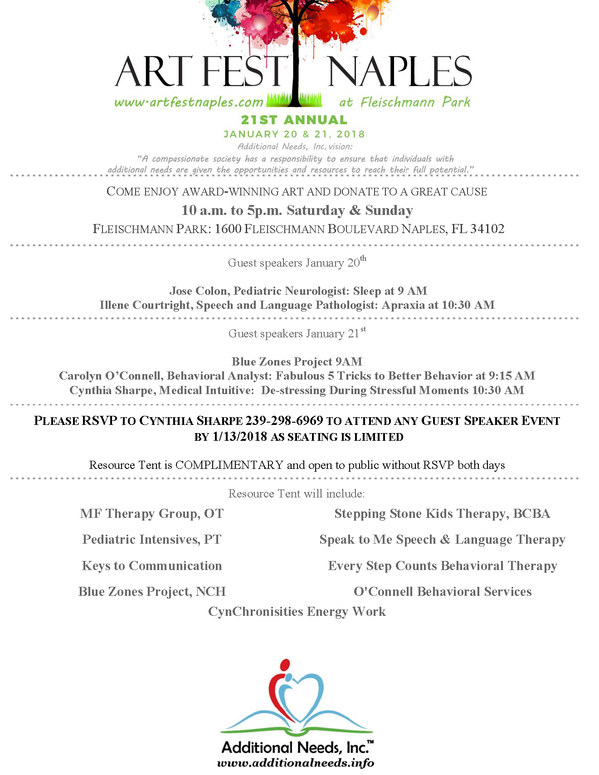 (Naples, Fla. – January 6, 2016) –Art Fest Naples is seeking volunteers for the January 23-24 event at Fleischmann Park. Volunteers age 16 and up are needed for 2 1/2 hours shifts beginning at 9:45 a.m. until 4:45 p.m. on Saturday and Sunday. Duties include collecting donations at the gates, assisting vendors and artists and other light duties. High school and college students are eligible for community service hours. All volunteers will receive an Art Fest Naples tee shirt. Art Fest Naples is a juried show featuring 140 fine artists. It is unique in Florida and the country because the proceeds benefit a 501(c) 3 organization, the Special Needs Children’s Fund. The mission of The Special Needs Children’s Fund is to improve the lives of children and young adults with physical and developmental disabilities, including autism, in Collier County. Fleischmann Park is located at 1600 Fleischmann Boulevard in Naples. For more information and to volunteer, contact Susan Housel at slhousel@gmail.com or 513.225.2797. To complete a volunteer application click here. Art Fest Naples Director Taire Malloy interviewed on WINK News. 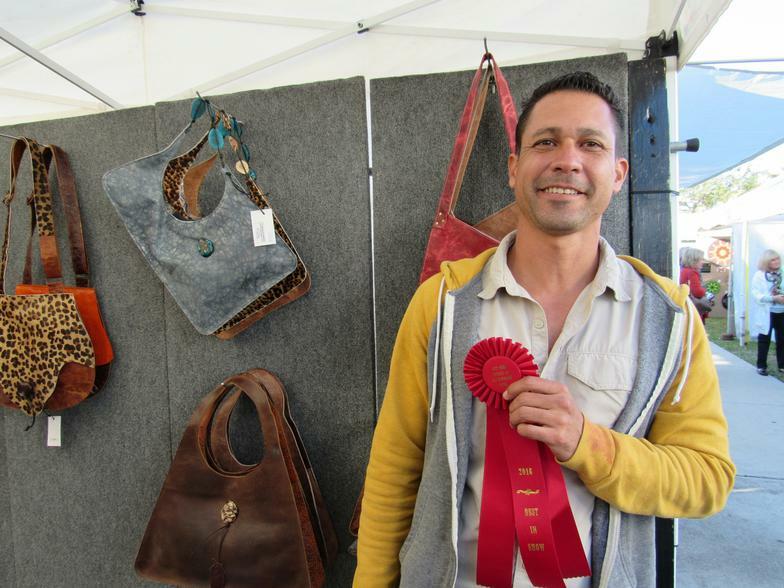 (Naples, Fla. – March 4, 2016) –Art Fest Naples 19th annual show was held January and 24 at Fleischmann Park. The juried show showcases fine art from 140 artists in a variety of mediums. The judges were Cavan Guenther, a Naples jewelry and mixed media artist, and Lynn VanSciver, a Fort Myers painter and mixed media artist. Art Fest Naples is unique in Florida and the country because the proceeds benefit 501(c) 3 organizations, including the Special Needs Children’s Fund. The mission of The Special Needs Children’s Fund is to improve the lives of children and young adults with physical and developmental disabilities, including autism, in Collier County. The 20th annual Art Fest Naples will be held January 21 and 22, 2017 at Fleischmann Park in Naples. For more information visit www.artfestnaples.com, or contact Art Fest Naples director, Taire Malloy, via email arfestnaples@gmail.com or call 239-634-2337. (Naples, Fla. – December 8, 2016) –Art Fest Naples returns to Fleischmann Park on January 21 and 22, 2017. Celebrating 20 years, Art Fest Naples is a juried show that offers Southwest Florida residents and visitors an opportunity to browse and purchase fine art that includes paintings in oil and acrylic, watercolors, drawings in graphite and pastels, art photography, blown glass, turned wood pieces, sculptures, metal works, ceramics and pottery, fiber art, hand-crafted fine art jewelry and a variety of 2D and 3D mixed media pieces. Sponsors include Arthrex, Ezon, Inc., Associates and Bruce L. Scheiner, Carter Outdoor, The Naples Daily News, John R. Wood Realtors, Mr. and Mrs. Capobianco and Driftwood Garden Center. Fleischmann Park is located at 1600 Fleischmann Boulevard in Naples. Sponsorships are still available. For more information about the 2017 Art Fest Naples contact Taire Malloy at 239-634-2337. Email artfestnaples@gmail.com or visit www.artfestnaples.com. (Naples, Fla. – January 11, 2017) –Art Fest Naples is seeking volunteers for the January 21-22 event at Fleischmann Park. Volunteers age 16 and up are needed for 2 1/2 hours shifts beginning at 9:45 a.m. until 4:45 p.m. on Saturday and Sunday. Duties include collecting donations at the gates, assisting vendors and artists and other light duties. High school and college students are eligible for community service hours. All volunteers will receive an Art Fest Naples tee shirt. Fleischmann Park is located at 1600 Fleischmann Boulevard in Naples. For more information and to volunteer, contact Taire Malloy at 239.634.2337 or artfestnaples@gmail.com. To complete a volunteer application visit www.artfestnaples.com. (Naples, Fla. – August 15, 2017) –Art Fest Naples at Fleischmann Park is seeking artists working in all media to exhibit at the annual show. The juried art show will be held January 20-21, 2018 at Fleischmann Park, 1600 Fleischmann Blvd., Naples, 34102. 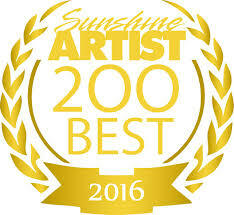 In its 21st year, the show has consistently been rated in the top 100 shows in the country by Sunshine Artist magazine. A jury of arts professionals will select the artists to participate in the show and will award prizes in numerous categories. All artists must apply online at www.artfestnaples.com by October 15, 2017. In addition to the beautiful park setting, Art Fest Naples is unique in Florida and the country because the proceeds benefit a 501(c) (3) organization, Additional Needs, Inc. Additional Needs, Inc. mission is to provide a user friendly and time-saving website with current and comprehensive information of available resources to assist children and adults with additional needs and their families in finding appropriate services. By employing individuals with additional needs to research and maintain the website, we provide a platform for them to share their abilities and unique insights and ideas. The website is also a vehicle for educating employers about the benefits of hiring individuals with additional needs as well as connecting them to employees. Sponsorships are available. For more information about the 2018 Art Fest Naples contact Taire Malloy at 239-634-2337. Email artfestnaples@gmail.com or visit www.artfestnaples.com. (Naples, Fla. – February 16, 2017) –Art Fest Naples 20th annual show was held January 21 and 22 at Fleischmann Park. The juried festival showcases fine art from 140 artists in a variety of mediums. The judges were Peter Garon, architect, artist and director of Peter Garon Studio, Naples, Pat Gomez, artist from Park City, UT and Naples and Logynn B. Ferrall, artist and curator of Amblewood Gallery in Serenbe, GA.
Art Fest Naples is a unique show because proceeds benefit children with special needs through the Special Needs Children’s Fund, a 501(c) 3 organization. 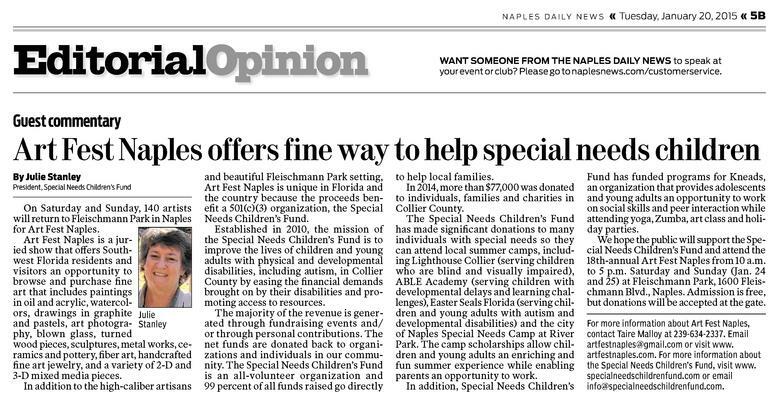 Over the past three years, Art Fest Naples has contributed approximately $80,000 in sponsorships and donations to Special Needs Children’s Fund whose mission is to improve the lives of children and young adults with physical and developmental disabilities, including autism, in Collier County. The 21st annual Art Fest Naples will be held January 2018 at Fleischmann Park in Naples. For more information visit www.artfestnaples.com, or contact Art Fest Naples director, Taire Malloy, via email arfestnaples@gmail.com or call 239-634-2337. 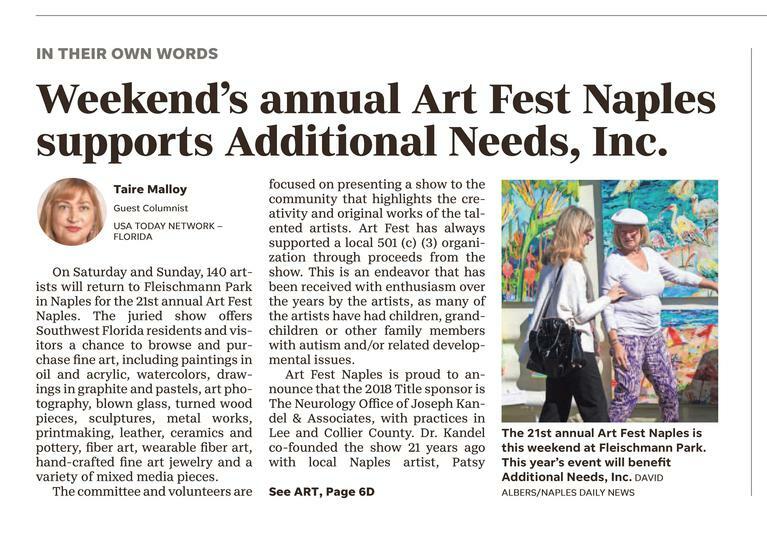 Event Supports Additional Needs, Inc.
Art Fest Naples returns to Fleischmann Park on January 20 and 21, 2018. Celebrating 21 years, Art Fest Naples is a juried show that offers Southwest Florida residents and visitors an opportunity to browse and purchase fine art that includes paintings in oil and acrylic, watercolors, drawings in graphite and pastels, art photography, blown glass, turned wood pieces, sculptures, metal works, ceramics and pottery, fiber art, hand-crafted fine art jewelry and a variety of 2D and 3D mixed media pieces. The title sponsor is The Neurology Office of Joseph Kandel, MD & Associates in honor of The Foundation for the Developmentally Disabled. Additional Sponsors include Naples Daily News, Associates and Bruce L. Scheiner, Carter Outdoor Advertising, Enduratech, the Warren Family, Bounce! Trampoline Sports, Table of Grace, GED Law, O’Connell Behavioral Services, Action Cooling & Heating, Advanced Stonecare & Restoration and Collier County Parks and Recreation. In addition to the high caliber artisans and beautiful Fleischmann Park setting, Art Fest Naples is unique in Florida and the country because the proceeds benefit a 501(c) 3 organization, Additional Needs, Inc. The mission of Additional Needs is to provide a user-friendly and time-saving website operated by individuals with additional needs with resources to assist individuals with additional needs and their families in finding appropriate services. Additional Needs is changing society's perspective from disability/special to additional needs using their website as the platform to do so. Additional Needs will have a resource tent at the event with local service providers including speech, physical, behavioral and occupational therapists. Local experts are scheduled to speak on Saturday and Sunday on topics such as better sleep for your child, Apraxia, behavior strategies and stress reduction strategies. Reservations are needed for the guest speakers. Visit www.additionalneeds.info or call (239) 298-6969 for reservations or more information. Fleischmann Park is located at 1600 Fleischmann Boulevard in Naples. Sponsorships are still available. For more information about the 2017 Art Fest Naples contact Taire Malloy at 239-634-2337. Emailartfestnaples@gmail.com or visit www.artfestnaples.com. Art Fest Naples, a juried art show that features 140 fine artists, returns to Fleischmann Park on Saturday and Sunday, January 20 and 21, 2018. 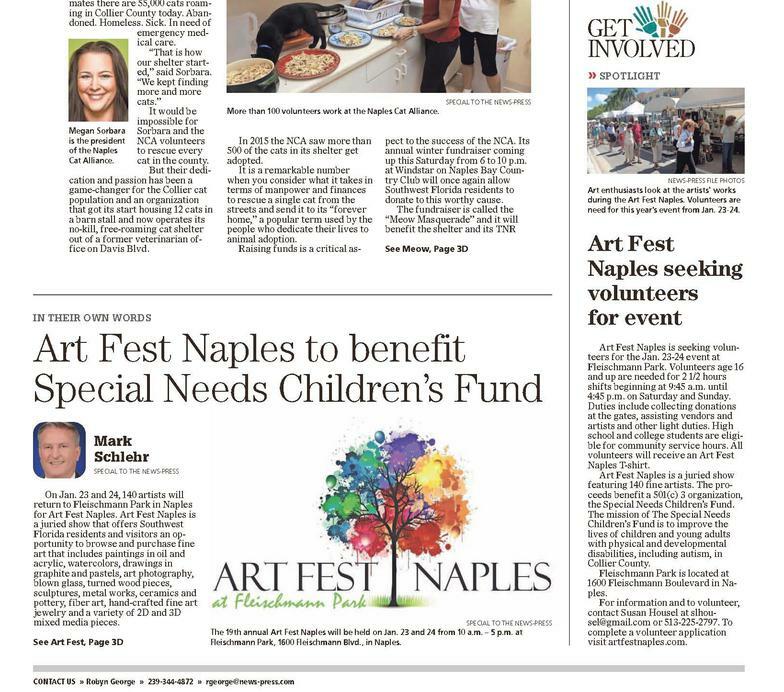 This year’s Art Fest Naples will include a resource area coordinated by Additional Needs, Inc., with local businesses that specialize in services for individuals with additional needs. • 10:30 a.m.: Illene Courtright, CCC-SLP, BCS-F, professor at University of Delaware: New strategies for treating Apraxia. Parents and speech pathologists are welcome to attend. 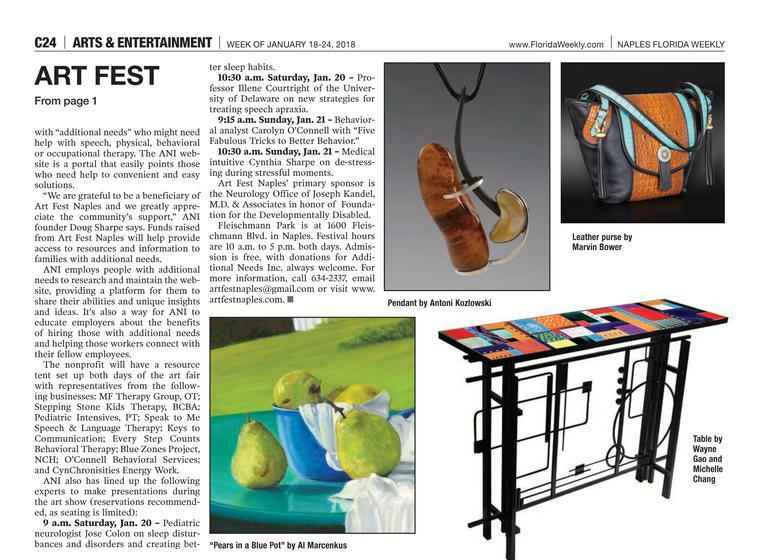 In addition to the high caliber artisans and beautiful Fleischmann Park setting, Art Fest Naples is unique in Florida and the country because the proceeds benefit a 501(c) 3 organization, Additional Needs, Inc. The mission of Additional Needs is to provide a user-friendly and time-saving website operated by individuals with additional needs with resources to assist individuals with additional needs and their families in finding appropriate services. Additional Needs is changing society's perspective from disability/special to additional needs using their website as the platform to do so. For more information about Additional Needs, visit www.additionalneeds.info or call (239) 298-1499. Fleischmann Park is located at 1600 Fleischmann Boulevard in Naples. For more information about the 2018 Art Fest Naples contact Taire Malloy at 239-634-2337. Emailartfestnaples@gmail.com or visit www.artfestnaples.com. 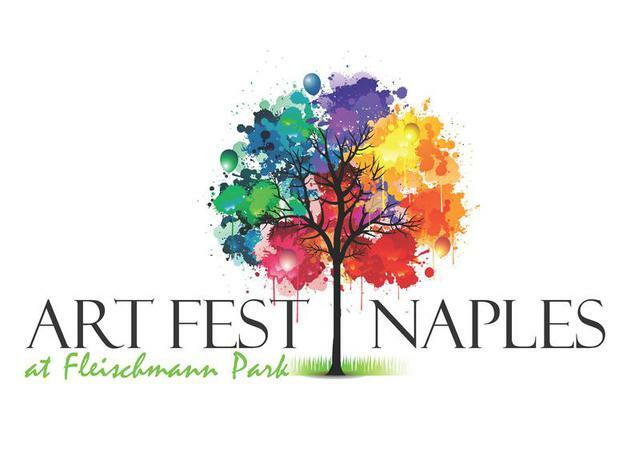 (Naples, Fla. – September 10, 2018) –Art Fest Naples at Fleischmann Park is seeking artists working in all media to exhibit at the annual show. The juried art show will be held January 19-20, 2019 at Fleischmann Park, 1600 Fleischmann Blvd., Naples, 34102. In its 22nd year, the show has consistently been rated in the top 100 shows in the country. A jury of arts professionals will select the artists to participate in the show and will award prizes in numerous categories. All artists must apply online at www.artfestnaples.com by October 15, 2018. “Some of the nation’s finest artists will be participating in Art Fest Naples, displaying and selling their work ranging from oil, acrylic and water color paintings, pottery, blown glass, metal, fiber and wearable fiber, turned wood pieces, sculptures, printmaking, photography and jewelry to a variety of mixed media.” said Art Fest Naples Director Taire Malloy. In addition to the beautiful park setting, Art Fest Naples is unique in Florida and the country because the proceeds benefit a 501(c) (3) organization, St. Vincent de Paul’s Meals on Wheels Program. Meals on Wheels serves the homebound and needy by providing more than 200 people hot meals five days per week and two frozen meals for the weekend. Nearly 200 volunteer deliver nutritious meals and provide daily contact for the recipient. St. Vincent de Paul’s other programs include the Family Assistance Center and Choice Food Pantry. For more information visit www.svdpnaples.org. Sponsorships are available. For more information about the 2019 Art Fest Naples contact Taire Malloy at 239-634-2337. Email artfestnaples@gmail.com or visit www.artfestnaples.com. (Naples, Fla. – January 1, 2019) - Art Fest Naples returns to Fleischmann Park on January 19 and 20, 2019. Celebrating 22 years, Art Fest Naples is a juried show that offers Southwest Florida residents and visitors an opportunity to browse and purchase fine art that includes paintings in oil and acrylic, watercolors, drawings in graphite and pastels, art photography, blown glass, turned wood pieces, sculptures, metal works, ceramics and pottery, fiber art, hand-crafted fine art jewelry and a variety of 2D and 3D mixed media pieces. Longtime sponsors include Associates and Bruce L. Scheiner and Associates and Carter Outdoor Advertising. 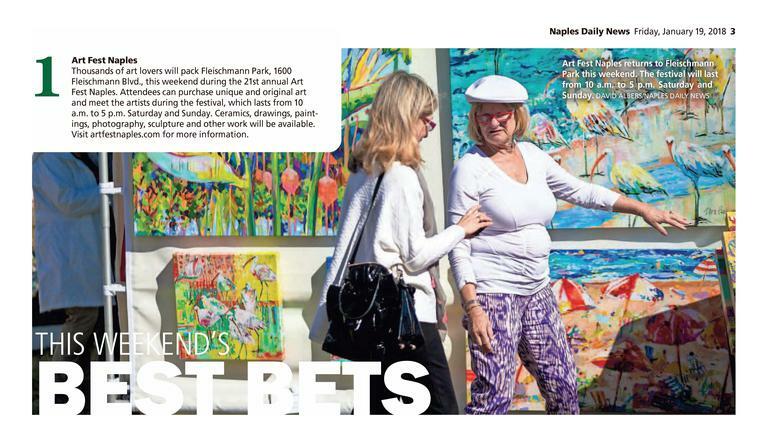 In addition to the beautiful park setting, Art Fest Naples is unique in Florida and the country because the proceeds benefit a 501(c) (3) organization, the Society of St. Vincent de Paul Naples’ Meals on Wheels Program. The program serves the homebound by providing up to 250 people meals five days per week and two frozen meals for the weekend. Volunteers deliver nutritious meals and provide daily contact for the recipients. St. Vincent de Paul’s other programs include the Family Assistance Center and Choice Food Pantry. For more information visit www.svdpnaples.org.